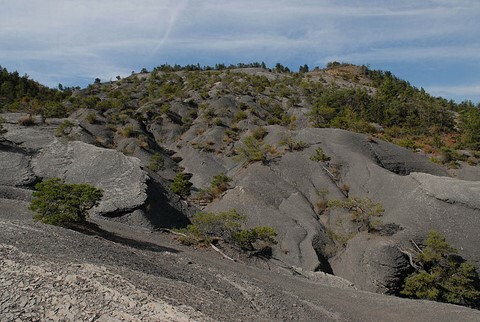 Crossing part of the Haute Provence Geological Reserve with lots of interesting formations and fossils. Great horseshoe trail around the summit of les Monges at 2115m. This independent walking holiday is the second leg of a unique long distance trek which crosses Alpine Provence from Nyons near the Rhone Valley to Grasse in the foothills above Cannes on the Mediterranean coast. This spectacular trip takes you through some wonderful mountain scenery where the Alps meet Provence. The second part of this journey through Provence crosses the pre-alps between Sisteron and Dignes les Bains. The mountains here climb higher than in the Baronnies and alpine pastures dominate the wild summits with forests of oak and lavender below. May and June are good times to undertake the walk for the array of wild flowers on the mountains. 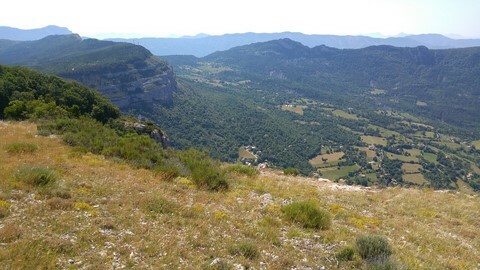 This walking holiday is ideal for those walkers who are looking for a unique challenge as part of a long distance, off the beaten track walk, as well as those interested in a one-off walking tour in the mountains of Provence to discover the fabulous panoramas and the geological gems of the region. 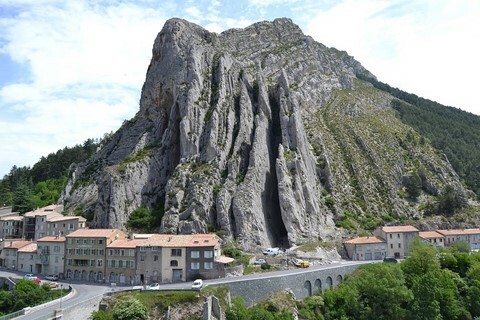 This leg of the journey starts in Sisteron, a wonderful citadel perched above the Durance and opposite the dramatic rock fins of Rocher de Baumes. At the end of the walking holiday you can take the famous Train des Pignes from Dignes les Bains to Nice. If you wish to combine this holiday with part 1 of the trail in the Baronnies, then from Laragne Monteglin take the short train journey to Sisteron in the morning and explore the town and citadel before setting out on your trek the next day. The walking on this self-guided holiday is graded level 4. The walking days average about 800m of ascent & 17km each day. The days are slightly shorter than in the Baronnies on part 1. On some days it’s possible to increase or reduce the difficulty. Due to the nature of the landscape some sections can be relatively steep. Paths are generally good and well defined, with regular waymarking, but there are sections which can be rough and mountainous in places and some sections follow open alpine pasture where the trails are less well defined. The steep terrain means that it would be unwise to do this holiday if you suffered from vertigo. This holiday is recommended for walkers with some mountain walking experience. Travel to Sisteron in the Durance Valley, gateway to the Alps. An easier day via a series of interesting geological sites such as a rock shelf covered in ammonites and slopes of black marl. You'll also discover a way of life that has now disappeared with abandoned old farms, chapels and agricultural terraces. 12km, +450m. There is also the optional climb of Tete de Geruen which would mean an extra 12km and 580m of ascent. Your walking trail climbs onto the summit of Corbeau and follows a ridgeline with good views before descending to the Duyes Valley with lavender fields and fruit orchards. 18km, +600m, -750m. 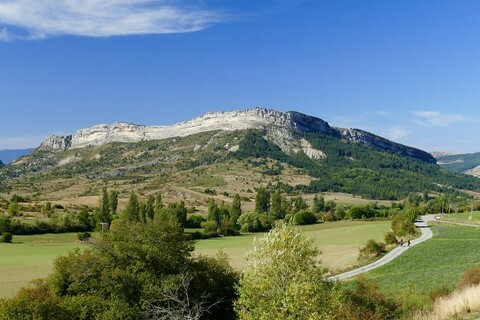 On this independent walking holiday crossing the Geological Reserver of Haute Provence, you will stay in a number of charming bed & breakfasts full of local character and small gites. They are a mixture of styles and comfort. All rooms at the guest houses have private bathrooms. We will inform you if this is not possible at the time of booking. Examples of the guest houses used on this part of our Alpine Provence holiday are shown below. The style and comfort varies from chic to rustic, but each has their own charm and your hosts will enjoy giving up their time to make your stay extra special. A hearty and healthy continental breakfast provides the perfect opportunity to discover the local specialities such as home-made jams and local yoghurt. At midday you will eat packed lunches prepared by your hosts, except the days leaving from Sisteron. Four evening meals will be taken at your guest houses. Your evening meals in Sisteron and Dignes les Bains are not included in the price and will be taken in a local restaurant. Make own way to and from this walking holiday accessible by regular train services. Also possible to continue this holiday following on from Part 1 of our Alpine Provence long distance trek by taking a small train ride from Laragne Monteglin. Walking holiday starts in Sisteron. Train: Eurostar and the TGV run trains from London to Lyon Part Dieu direct and changing at Lille or Paris. 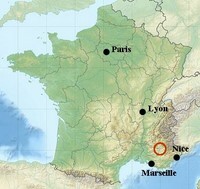 Either take a TGV to Marseille and then TER train to Sisteron or trains via Valence & Gap. Return journey from Digne les Bains take Train des Pignes to Nice. TGV trains to connect with Marseille, Lyon and Paris. Flights: The closest airports are Nice, Avignon and Marseille. Trains from Nice to Sisteron at start of trip go via Marseille. Therefore the best option (if possible) is to fly into Marseille and take direct train service to Sisteron and fly out of Nice after having taken Train des Pignes to Nice from Dignes les Bains. Self-drive: Chanel crossing by ferry with P&O or DFDS ferries and by rail with Eurotunnel. Once in France, drive time from Calais to Sisteron is about 10 hours, excluding long breaks and costs about £50 in motorway tolls. Leave car at first guest house in Sisteron. Please contact us about parking. To return to Sisteron from Dignes les Bains there is a regular bus service run by LER, lines 37 and 33, which run at least 5 times a day between the towns, costing €5.50. A taxi between the towns would cost about €70. Please check that the walking holiday is available before making any travel arrangements. Please visit our travel shop page for links to useful travel websites.